POWER SKIFF 14 is designed to be a quick building project for fishing, crabbing or just messing about the waterfront when the whim strikes. Who doesn't dream of the always ready power skiff when there are a few minutes available, the fish are biting and the day is beaconing to be out there on the water. Construction is stitch and glue with plywood and epoxy. There is a hull kit now available for this fun little boat. Estimated cost for quality construction materials (not including power) is $1700. This cost includes a high level of outfit and finish you can be proud of after putting the effort into building this fine boat. 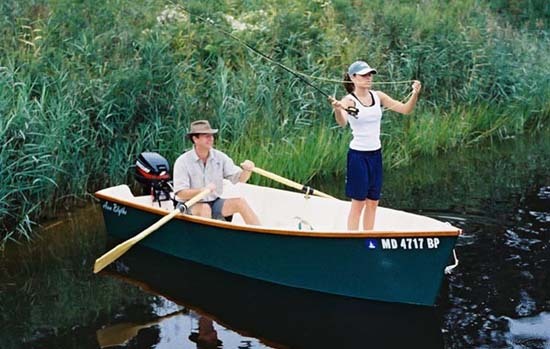 Purchase and Download Study Plans for the POWER SKIFF 14 for $5.00 in PDF format (zipped file). 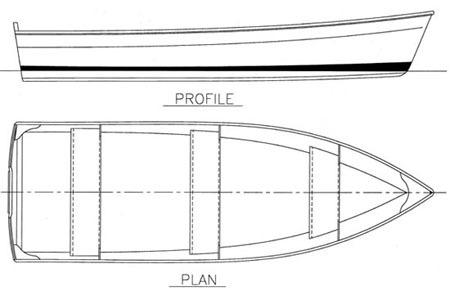 Purchase Construction Plans for the POWER SKIFF 14 for $65.00 for delivery by US Postal Service. Purchase Full Size Frame Lofting for the POWER SKIFF 14 for $65.00 for delivery by US Postal Service.